Emery. White Emery  - $5.00 : Yarn Tree, Your wholesale source for cross stitch supplies. Item 4333. White Emery. Keep your needles shiny and sharp with Yarn Tree’s special white emery packet. 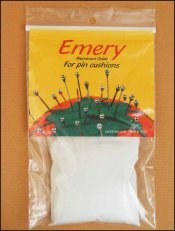 4 ounces of fine grain white emery (aluminum oxide) perfect for making your own pincushions. Very clean, pure, and non-toxic. Made in the USA.